You are here: Home / Freelance Work at Home / Freelance Projects – which sites have more of your type of work? 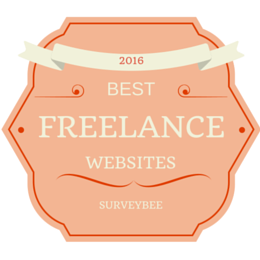 Freelance Projects – which sites have more of your type of work? This month I took a quick snapshot of the projects on offer at seven of the top freelance sites on one particular day. I’ve no idea whether this day or this month (November 2013) was typical but there’s no reason to think it wasn’t. 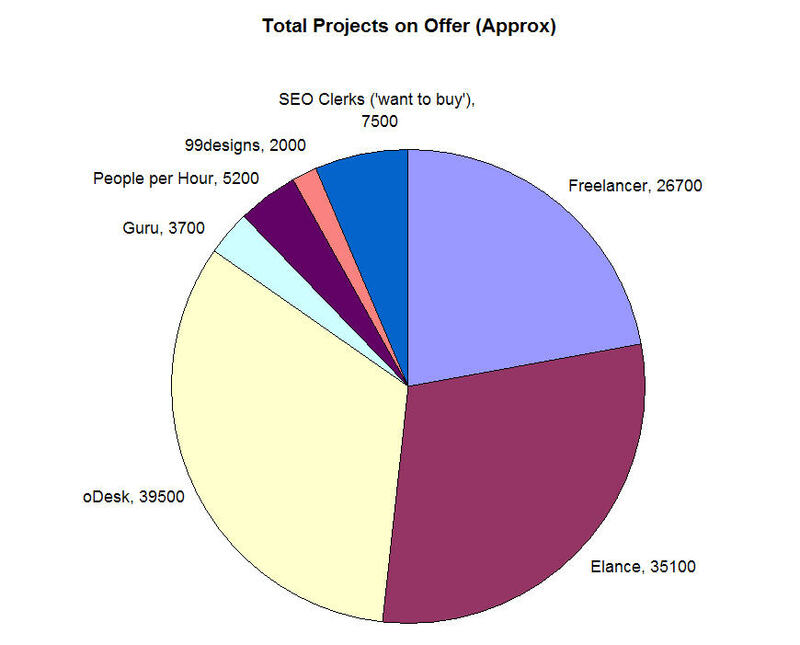 This split shows the number of projects on offer for bidding by freelancers. It doesn’t include any of the projects which are allocated the other way round, that is when the Freelancer offers a piece of work for a set fee and buyers choose from the marketplace (as happens on Fiverr for instance). This first pie shows how the overall jobs were split between these seven job sites. 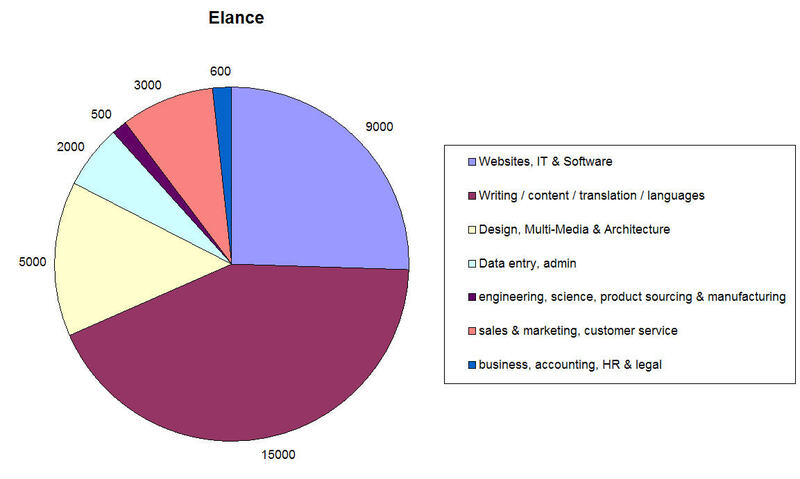 So you can see for instance that Freelancer, Elance and oDesk have the lion’s share between them. 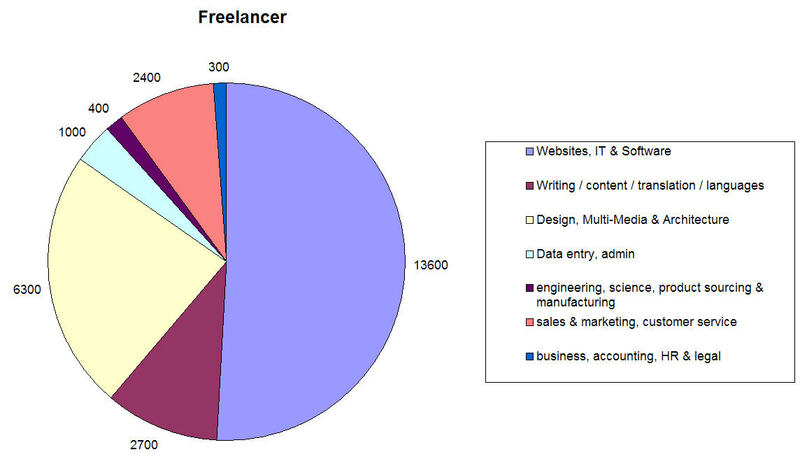 The chart doesn’t reflect the entire freelance jobs market, only these sites on this particular day. But these are the biggest 7 in terms of the number of jobs on offer. 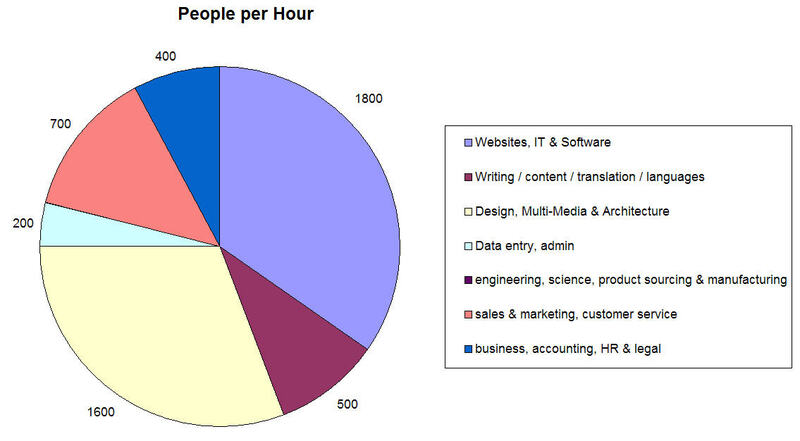 The following set of charts show the split between the various job categories on each site and the approximate numbers of projects. The categories are not exactly the same across different sites but I’ve done my best to group them in a meaningful way. It should give a good enough picture to form a comparison. 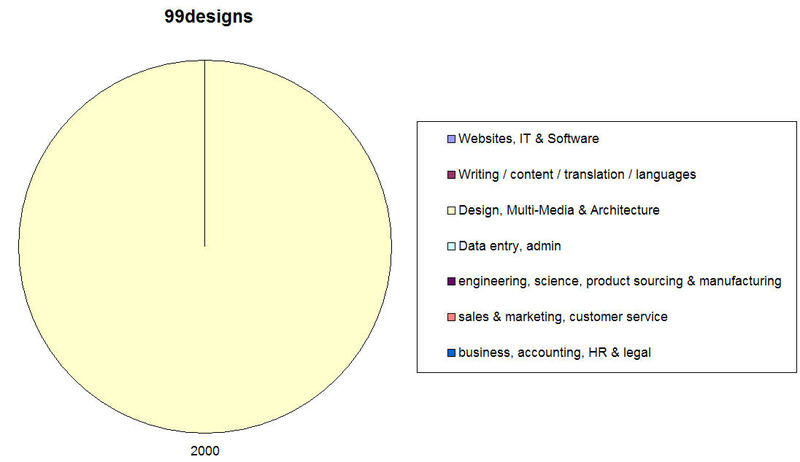 So you can see that 99designs has nothing but design projects, Elance has a certain bias towards writing jobs and Guru towards more techie computer projects, whereas SEO Clerks has a lot of jobs connected to sales and marketing. Judging by this snapshot oDesk looks like the largest freelance site just now with the highest number of projects up for offer on the day I looked. There’s a good mix of projects across different types of work. Elance has by far the greatest number of writing/editing/translation type projects of these sites. 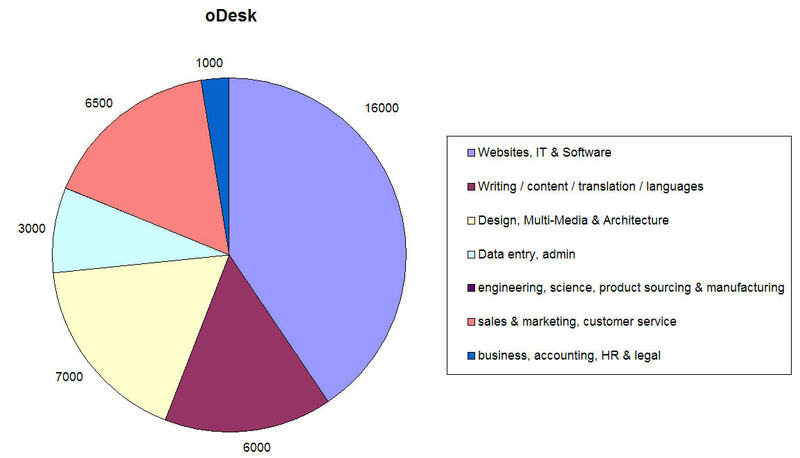 Like oDesk Freelancer have a mix of work across the board, dominated somewhat by techie IT, website and design type work. 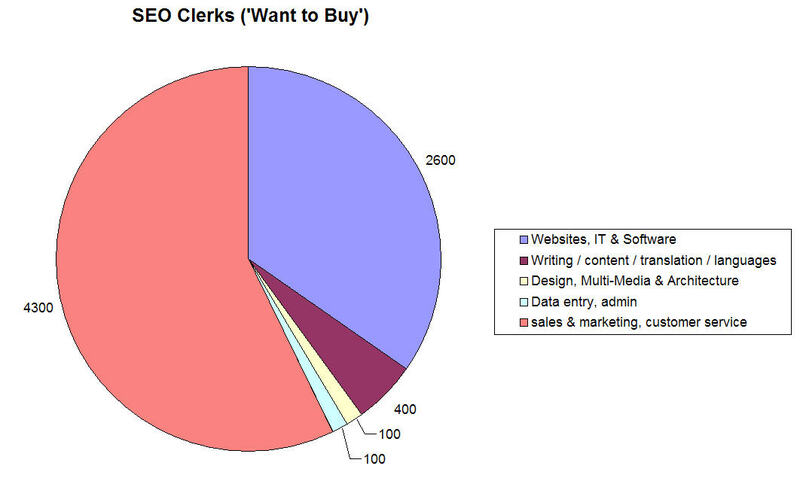 I looked at the ‘Want to Buy’ section of SEO Clerks which is where buyers can post projects as oppose to the Marketplace where freelancers offer packages. There’s a clear focus on SEO Clerks, as the name suggests, towards the online sales & marketing sector, and if you look at their site the projects in that category tend to be mainly connected with website marketing and social media type activities. Although there are a fair number of website development jobs in fact a lot of them relate to SEO activities like link building. PeoplePerHour is again dominated by website, IT & design work but it has a good amount of more general business projects, especially relative to its size. 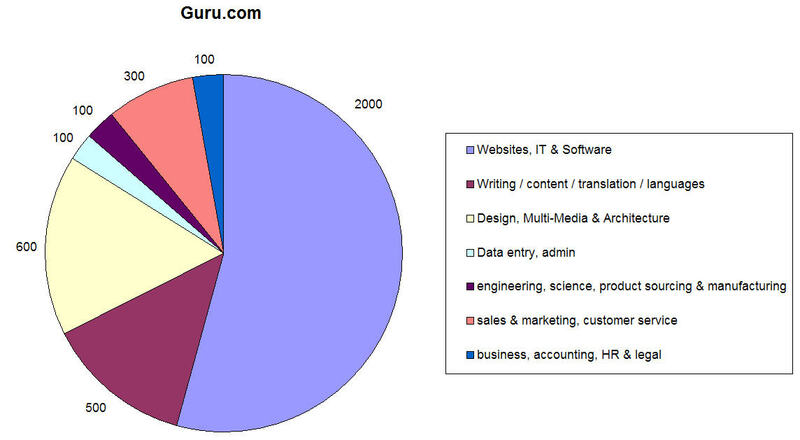 Of all the sites Guru is most heavily biased towards website/IT/Software/programming type jobs. It’s relatively small compared to the likes of oDesk in terms of project numbers but still had a few thousand availoable when I looked. The name and the chart speak for themselves! It’s a specialist site and definitely one to target if you’re a designer. Of course these pies are purely about the numbers, they offer no comment on the quality of jobs or the rates on offer but at least it’ll give freelance candidates some idea of where to start looking for their own type of work.